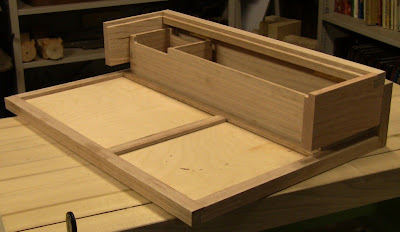 With the main base and box assembled, it was time to build the lid. 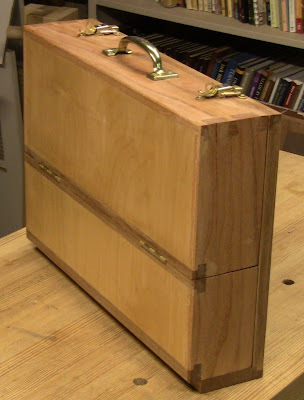 It has two parts, with a pair of hinges in the middle so that it folds back out of the way. I started with the rear section. 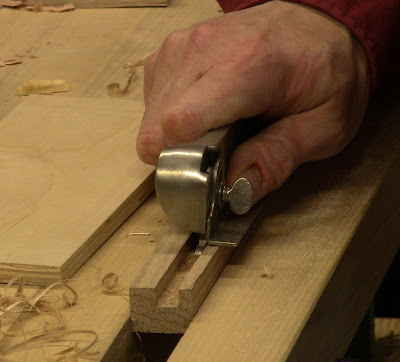 Using the jack plane to quickly reduce the width to the right size for the sides. 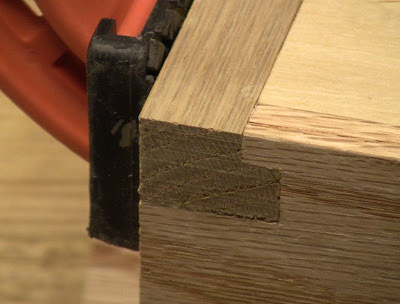 I followed up with the jointer for a crisp edge. ...and the smoother for smoothness. 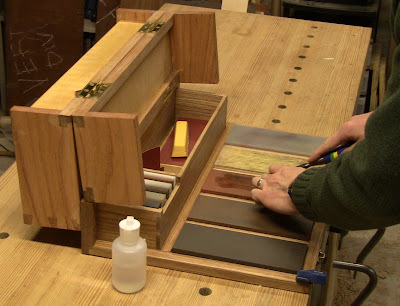 I had already made up the rear banding piece where the first set of hinges would go. 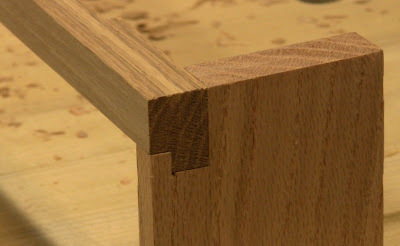 To join it to the sides, I used a cross between a lap joint and a dovetail. The joint dry fit. I used dovetailing methods to cut it. Dry fitting the sides to check the hinge. Um, do you see a problem here? Argh! The change in the position of the rear hinge strikes again. Now the sides don't come down to meet the base. There's an hour's work wasted. In his book on joints, Jim Kingshott writes about mental attitude, saying you should be ready to remake any part. Ok, get over it. Get through the anger, denial, and acceptance and move on. After remaking the sides, gluing up the rear lid section, with the 1/4" plywood in the rabbet. Closeup of the joint where all three pieces meet. While this dried, I made a riser base. This is a holder for a single stone, that will rest on top of another stone. That way I can stack one stone on another if I want to use it from the side more, even if it's not the one sitting in the right-most position. 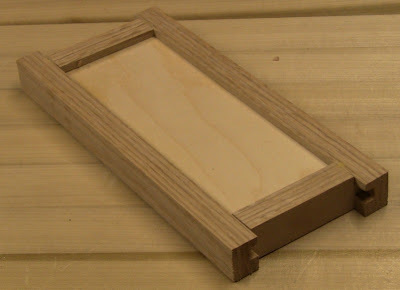 The riser is just a piece of 1/2" plywood wrapped in an oak frame. This is the reason I added the spacer between the stones and the divider (which threw off the spacing in the box which threw off the hinge position which resulted in having to remake the sides!). The spacer provides a lip for the far edge of the riser to rest on as it sits over another stone, so it will stay in place during use (you'll see pictures of this at the end). 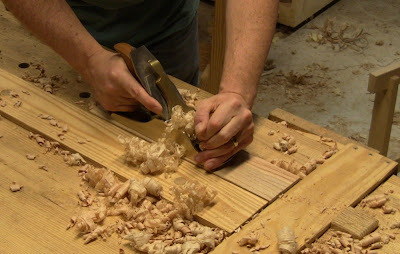 Using a wooden plow to mold the groove for the plywood. It's offset from center so that it holds the stone up away from the one it's stacked on. 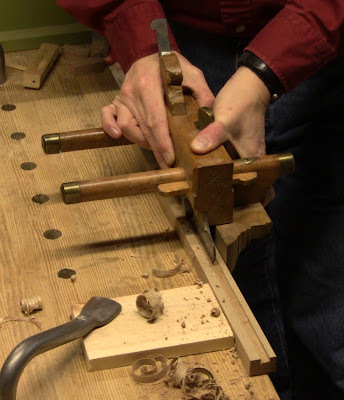 Fine-tuning the groove with a side-rabbet plane. You can see the piece of plywood that will fit in it. The dry-assembled riser, with the horns on the ends still to be cut off. After trimming and gluing the base, chamfering the edges with a smoother. Once the rear section of the lid was dry, I fitted up the front section to it. 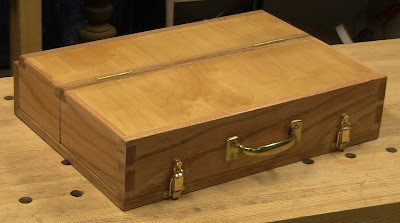 It went together much the same way, except that the front of the lid is fully dovetailed, again using Paul Sellers' method. The joints came out nice and tight, though I still had to fill in a few small gaps with glue and sawdust. 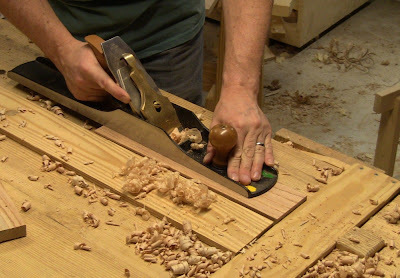 Planing the lid front dovetails flush. This really makes things look crisp and sharp. Flushing up the oak banding to the plywood surface on the rear section. Flushing up the bottom side of the base. Next was installing the hardware. The hinges were straightforward, since I had pre-mortised the oak. The latches were another story. Initially, I used window latches from Home Depot. I ended up shearing off 3 of the screws as I drove them. What do they make these from, aluminum? Ok, I realize that window sashes aren't normally made of oak, so lighter grade metal should suffice. But then one of the latches started jamming up when I rotated it. Urgh, why does Home Depot sell this crap? It's as much the fault of the manufacturers in their race to the bottom for lowest price. Don't they realize that while we want low cost, we don't want it so cheap it falls apart? Are we going to have problems over the next 50 years where the houses built with this stuff start coming down around our ears? I ended up making a trip to Rockler and picking up some catches. These were a different style and heavier gauge metal. 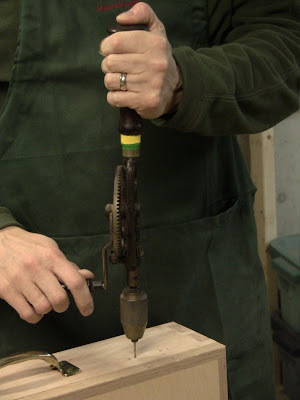 Drilling the holes for a window latch. You can just barely make out the sheared-off screws buried in the wood. Driving the replacement screws for the lower latch part. I replaced this with the Rockler latches, but the process is the same. There was one little bit of woodworking left, installing some spacers in the lid to hold the stones in place when it's closed. There are two of them, near each end of the stones. This ensures nothing moves around when I carry the box around. 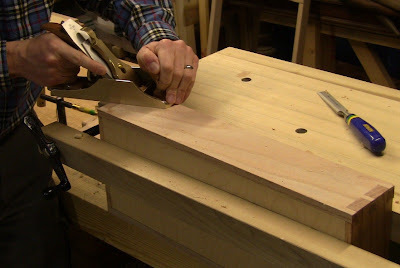 Friction-fitting a piece of white pine for the spacer. I repeatedly shaved its width and closed the lid to see how it bore on the stones, until things closed up snugly. The second spacer acts as a friction-fit holder for storing the riser. 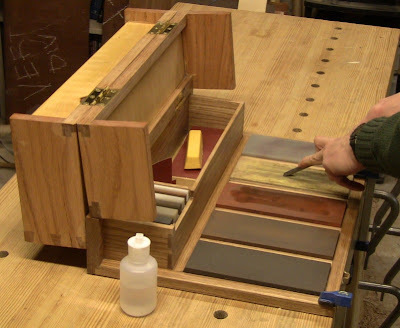 Making up a matching sanding block out of MDF and pressure-sensitive sandpaper. 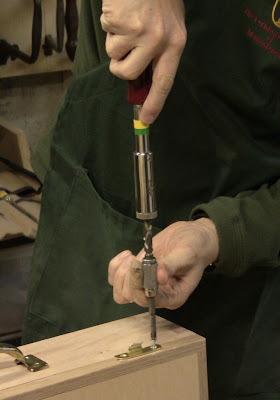 This is useful for extra-heavy grinding when shaping a damaged tool. That saves my coarse India stone from wear. Fireplace gold: I save all the large shavings for firestarters. Dry shavings light instantly and burn hot, well-oxygenated to get the fire started. Of course, that makes them a fire hazard in the shop. With construction complete, I applied two heavy coats of outdoor grade "spar varnish" polyurethane. I laid it on pretty thick, so thick in fact that I had to scrape a little down to fit the stones in place. The finishing job is not great, you can see a few patches where I didn't clean up the glue well enough, but it'll do for shop furniture. Lid partway open. The riser is resting between the spacers in the lid. I'll be adding a screw from the outside to each spacer to hold them in place better. The far one has come loose. Fully open and secured for use. These clamps are just long enough for the thickness of my bench top. 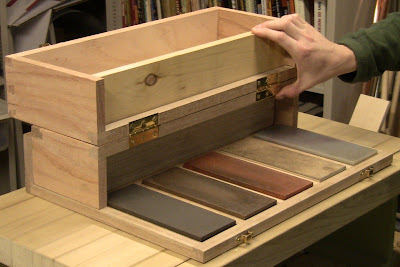 While I built this to be portable, I'll be setting it in a dedicated spot in the shop, so I can just lift the lid quickly and sharpen as needed (the lid can be left unsecured as a loose dust cover). 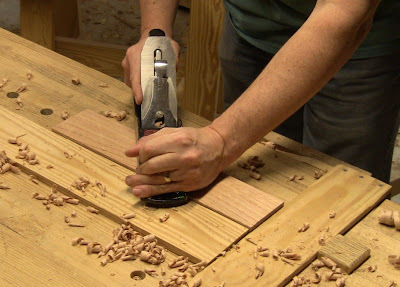 The station is held to the bench with a pair of Rockler 5" Clamp-it bar clamps (also available in 8" lengths). They're small enough to fit in the rear box during travel. 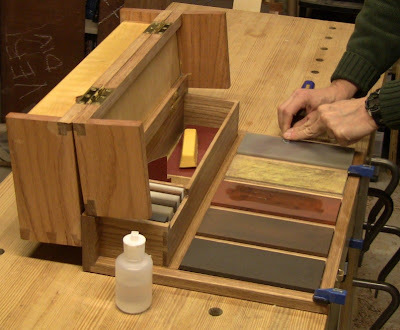 The box also holds the sanding block, extra sandpaper, strop compound, oil bottle (one that doesn't leak! 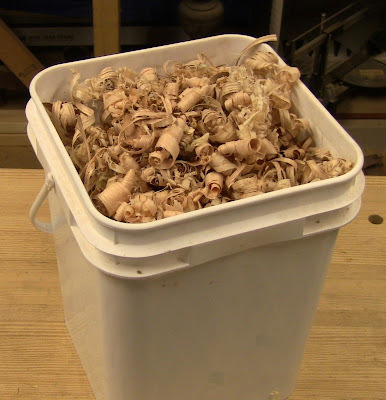 ), small rags for wiping off oil, and file and burnisher for sharpening scrapers. I'm still refining my sharpening process, but here's a brief description of what I'm currently doing. There are of course many ways to get this job done, feel free to use something different! 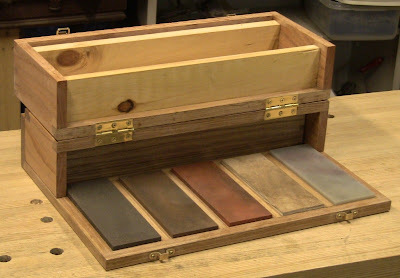 The station has, from left to right, Norton coarse, medium, and fine India stones, homemade leather strop block, and Norton translucent Arkansas stone. The Arkansas is on the end so that I can hold irons and chisels off the side. 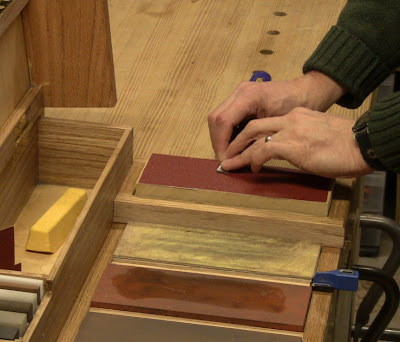 I always use the strop straight down its length, never off the side (see photos below). 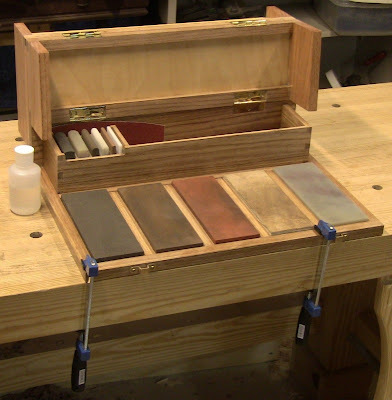 Once I have a tool tuned, I keep it sharpened with just the fine India and Arkansas stones, followed by the strop (I recently started using Flexcut Gold compound on the strop, and find it much better than the green stick I've been using). I can actually go awhile just with the strop. Once that wears down too much, sometimes it just takes a little work on the Arkansas before stropping. In general, I try to go back the fewest steps necessary. As long as I maintain the edge in good condition, I only ever need to spend 30-60 seconds at a time. Occasionally, if I wait too long, I may have to go all the way back to the medium stone for 30 seconds. 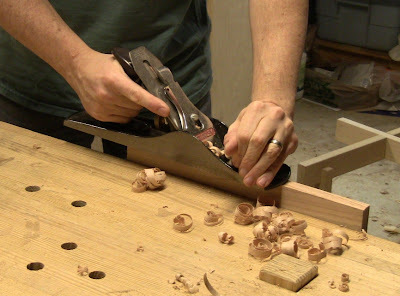 For heavier work, such as when I've dinged an edge, I'll go back to the coarse. 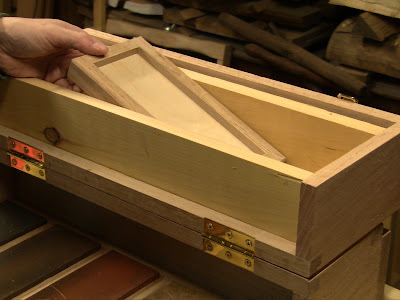 For really heavy shaping, such as to restore a tool fresh from the flea market, I'll use the sanding block. That saves wear and tear on my coarse stone, especially if there's a lot of work to be done; I may go through a several pieces of sandpaper. 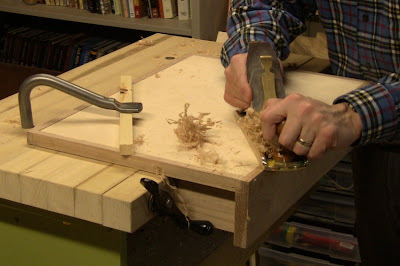 I sharpen free-hand without a jig. 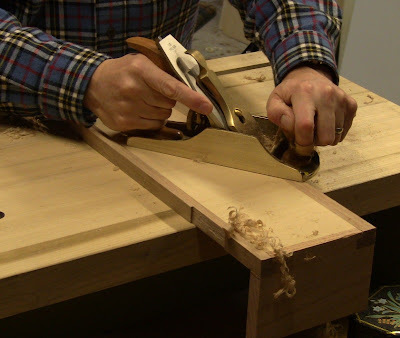 I use both the Grimsdale method of convex-bevel (also used by Paul Sellers) and a double-bevel. For the double-bevel, I'm experimenting with various patterns on the stone, from straight up and down the length, to side-to-side, to figure-8. Given the variety of blade shapes in width, thicknesses, and length, as well as handle size affecting balance in the hand, it's good to be versatile and be able to shift approach as needed. Sharpening in different directions also helps to put specific scratch patterns on the blade. Then when you go to the next stone and use a different pattern, once the old pattern is gone, you know you've done the whole area. Starting some maintenance sharpening with the fine India stone. 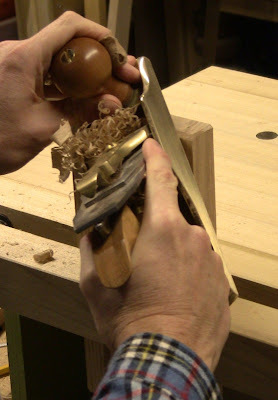 After working the bevel on the Arkansas, going up and down the side to remove the burr from the back. 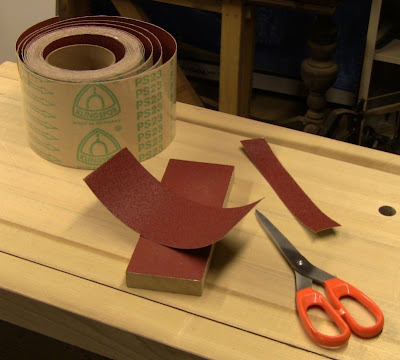 Pulling the bevel down the length of the strop. Then I lay the back of the chisel flat on the strop and draw it down. 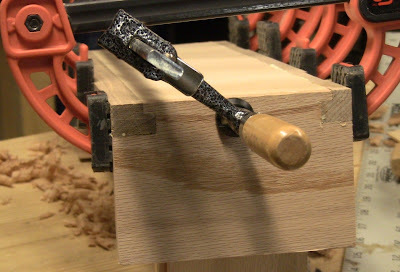 Closeup of the riser base holding the sanding block. It's stacked over the Arkansas stone, but will fit over any of the stones. Also, any stone can be removed from its normal position and put in the riser if I need to work off the side of the stone like this. The riser can also be used as a standalone stone holder on the bench. Have sharpening station, will travel. Once I set this up in its permanent spot, I'll be able to quickly step away to sharpen, then get back to work. And when I travel for a class or a demo, I'll be just as ready. Great job! What a well thought out, well executed project. You're gonna get a LOT of use out of this. I love that it's portable AND will keep your stones clean and dust-free when in the shop. I REALLY like this. Well designed and well executed. I need something like this. The slight inconvenience of getting organised for sharpening sometimes makes me delay doing it. Great project Steve. The pictures really helped to pull it all together. It's making me think of something similar that I could make for my water stones. Sure is a lot cleaner than the oil bath nortons that I currently use. Great idea and the write up was really well done.